Mild, tea fragrance. 32 to 37 petals. Average diameter 5″. Medium to large, full (26-40 petals), borne mostly solitary, high-centered bloom form. Blooms in flushes throughout the season. Medium, bushy, upright. Large, matte, medium green foliage. Height of 3′ to 5′ (90 to 150 cm). Width of 2′ (60 cm). 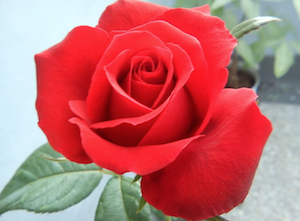 A new hybrid red tea rose for cut flowers and garden decoration, having as it seed parent ‘Red Planet’ and as its pollen parent ‘Pharoah’, Plant Pat. No. 2825… produces nearly continual, abundant, brilliant and lasting long-stemmed red flowers with a heavy petal substance lending to their longer-than-average longevity, both in the garden and in the vase… usually bears its flowers singly, sometimes 3 to 4 flowers per stem in irregular clusters, on strong stems that are long for the class.